Quickly, I go to the Agents of Field vault. Using the secret code, I unlock it and take out a folder. Blowing off the dust, I open it to reveal my gardening plans for 2017. Here lies several months of work, notes about things that grew well in 2016, jottings about last year’s failures. (Damn you potato blight!) Allotment blueprints, internet seed receipts… it’s all here. What I hold in my hands right now will surely help me in my noble quest, and lead me to the gardening Holy Grail. Seven days into 2017 and I’ve sown the first seeds of the year. 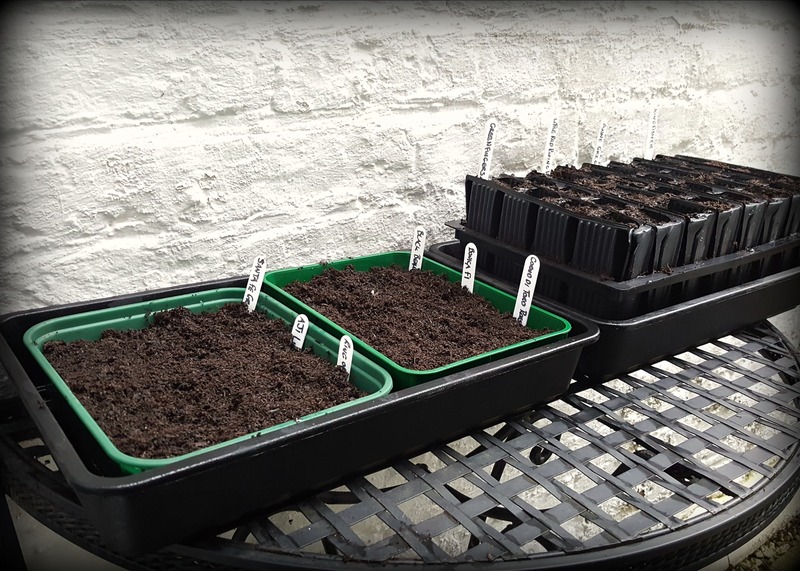 Chillies, peppers, aubergines and sweet peas are now warming themselves in propagators, promising the reward of fruits and blooms later this year. This has definitely become a tradition now in the Agents of Field household. 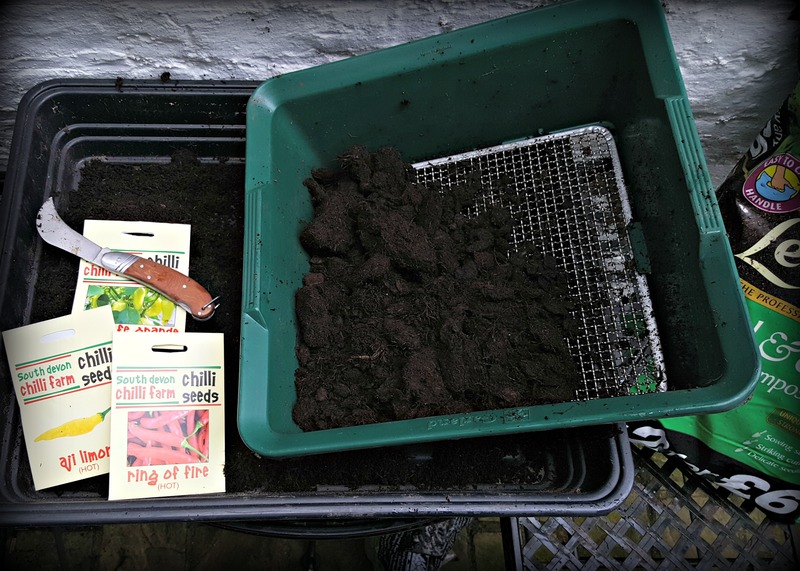 The first weekend in January is a time to clean down the propagators, get out the seedling compost, and get those new seeds sown. Garden magazines appearing on the shelves in January offer varying advice on how to sow your first seeds of the year. Whilst it can seem a little overwhelming for the amateur gardener, in the few years I’ve been toiling the soil, I’ve found the best advice to be this: get out there and give it a go. Of course you need to be mindful of weather conditions, when a seed should be sown and how to nurture something so fragile. But understand the basics, and you won’t wander too far off the yellow brick road. It was my Dad’s advice that put me on the right track in growing these fruits. “The earlier you start, the more time you give the plants to grow and ripen their fruits”. The Jedi Master spoke, I listened and have been doing it ever since. 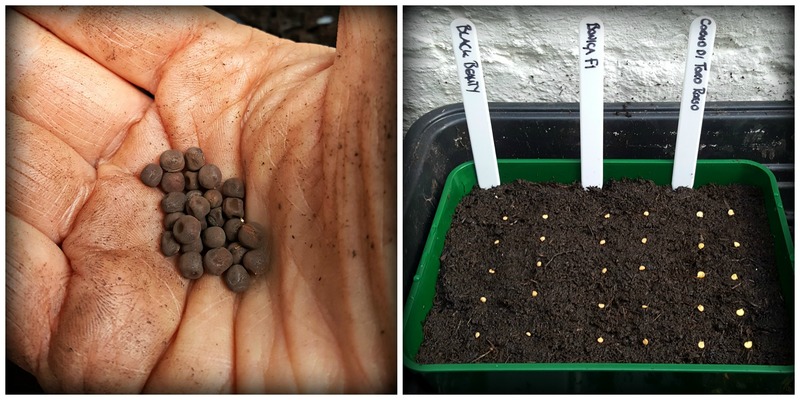 I grow the seeds on a bed of sieved ‘seedling’ compost. Ensuring the soil is firm, I individually sow the seeds about three-quarters of an inch apart. Once sown, I gently sprinkle sieved soil, lightly covering the seeds. Then I sit the propagator in a tub of water so it draws it in from the bottom, thus preventing the seeds from moving around if you had watered from above. I then place the propagator on a sunny warm windowsill and wait for them to germinate. I won’t lie, I regard these particular seeds as the Mariah Careys of the plant world: they can be quite the diva at times. You think you’ve done everything right by them, yet weeks later, nothing. Most years I tend to get some seed failures, so there’s often a second sowing, but I allow the diva to have her moment as the final result is always worth the wait. And if there are too many plants, then they make gifts for my Dad and neighbours. Once the ‘true leaves’ are growing on the young plants, I pot them on. Before the time of planting out in May, they’ll probably have been potted on at least twice. Come late spring, I plant them into their final position, somewhere warm, sunny and wind free. It’s a question of staking, tying in, feeding/watering and keeping the bugs away. Some say that before planting you should soak the seeds the night before, or nick them with a knife to help them germinate. I’m not against these tried and tested methods, as they clearly have merit, but it hasn’t made any difference to my sweet peas over the years. They still germinate, grow and bloom at the same rate. So let me throw my trowel into the sweet pea debate and offer up my acquired Jedi knowledge on this worthy flower. Sweet peas have a long root system so I grow them in deep-rooted pots, or root trainers, normally two or three seeds to a pot. Plant a couple of cms deep, water in, cover them over with a propagator lid and then sit them on a warm, bright window sill, checking on them every so often to make sure they haven’t dried out. Once the young plants emerge, I then take them out to the greenhouse where they will happily grow on. Keeping them growing on in a warm environment can make them leggy and weak. So here’s a question: do you prefer bushes or cordons? I’ll happily take both. But if you’re looking for a little bush in your sweet pea, pinch them back to the third pair of leaves. However, if you’re someone who likes a cordon sweet pea, once you’ve planted them into the ground, tie them to a tall stake. As they grow, tie them back at intervals. When side shoots appear, pinch them off. The energy will go into the cordon, making it stronger. The end result will be fewer blooms compared to the bushy method, however, the blooms will be bigger. Whether they’ll have a stronger fragrance is down to the variety. I think the sweet pea is something of true beauty. It was the first flower I ever grew, so it holds a special place in my heart. Yet, as summer goes on, they can suffer from mildew and go to seed. Water them at the base of the plant and pick the flowers every other day and this will help maintain them for longer. With so many varieties to choose from, and new varieties appearing every season, what is there not to like? Every season someone seems to have a new variety named after them. Ahem.. Of course If anyone wants to name a new variety after me: Sweet pea ‘Hunky Ade’ (delicate little flower with the sweetest of smells, guaranteed to make everyone smile), I’ll happily take it.